Facial augmentation procedures are growing in commonality and the appearance of ones face can be balanced with a simple day procedure. Two of those procedures growing in popularity are chin and cheek augmentations. Ideal chin positions for women are 1 - 2mm behind the furthest projection of the lower lip and for men, meeting the furthest projection or slightly ahead of it. On a case by case basis this rule is adjusted to take into account the nose measurements and cheeks to ensure that the face isn't thrown "off Balance" by a too dramatic alteration. 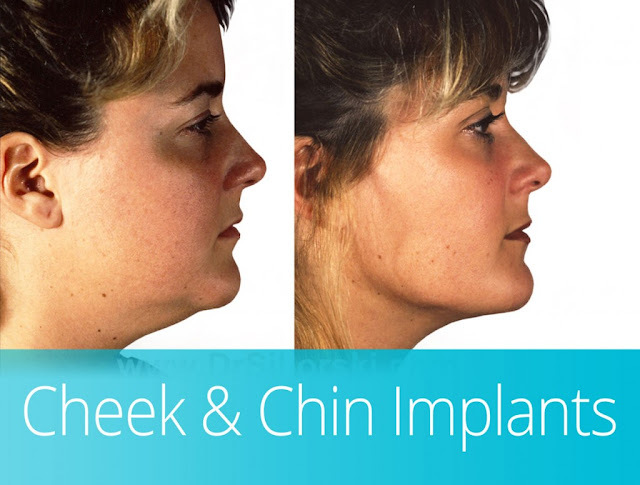 There are a number of ways that Chin augmentations are performed. Most commonly an incision is made on the inside of the mouth inside the bottom lip and a silicone strip is added just above the chin bone. A similar result can be achieved by cutting the chin bone and repositioning the chin. This procedure is considered more invasive and required more time to heal. Cheek augmentation has also grown in popularity since the 90s and is more commonplace. Just as with Chin augmentation, the appearance of the patient can be altered dramatically and consideration should be taken into account to ensure optimal results. The projection for cheeks should be as far as the cornea of the eyeball or slightly further out. As with Chin augmentation, other facial factors are also still taken into account. This procedure can also be done through the mouth through an incision inside the inner cheek and the implant is positioned to achieve the desired results. A consultation with a plastic surgeon is used to thoroughly determine the best shape and size for the implant and to make sure that the desired results are achieved. Consultation fees can be free or start from $100 with the price of the consultation fee to be deducted from the surgery cost. The physician fees can start from $2500 to $5000 but this does not cover the cost of the implant itself or the cost of the surgical room. It is important to clarify what extra costs are involved over the phone prior to a consultation session with a physician to ensure you are aware what is within budget. The implants them self begin at $2500. Costs involved with plastic surgery are not generally covered by private insurance. The procedure is performed in an outpatient clinic and you will be discharged the same day you check in. The procedure takes from one to two hours and when the procedure is done patients are usually prescribed pain killers to help with the pain that is apparent with most invasive surgeries. It is best to rest for the first week and those undergoing the treatment are sometimes asked to take two weeks off work to recover. Any form of physical activity is advised against for the first 2 - 6 weeks to avoid aggravating the area or dislodging the implant. You will be supplied with specific recovery information from your physician. Results are immediately apparent and become more prominent as the swelling reduces.